There’s a lot to love about Castle Rock – 51 miles of trails, summer events in full swing and strong schools. Those who live here know that, and many others are taking notice. Consumer advocacy website NerdWallet recently ranked the best Colorado towns for young families, and Castle Rock came in fifth. They've begun moving earth at the new park site! Castle Rock continues to be a great place to live, as demonstrated by the more than 1,300 responses received to the Town’s 2013 community survey. Survey respondents indicated that the Town government is doing a solid job, and that they favor maintaining Castle Rock’s small-town character as the community grows. World Compass Academy is a newly proposed free, public, charter school in Castle Rock, CO. World Compass Academy engages and inspires learners in a safe, challenging, and individualized learning environment which cultivates and fosters character, a lifelong love of learning, and the skills to engage in the global community. Tri the Rock race results announced Tuesday May 21, 2013. The event set a participation record of 560 children from Castle Rock, Castle Pines, Parker, Highlands Ranch, Lone Tree, Boulder, Denver, Littleton, Roxborough, Colorado Springs and Franktown gave the race their best try in Sunday's annual youth triathlon, Tri the Rock. The new 225 acre Philip S. Miller Regional Park off of Plum Creek Pkwy. in Castle Rock has exciting features planned! New Live Webcam in Castle Rock, CO! 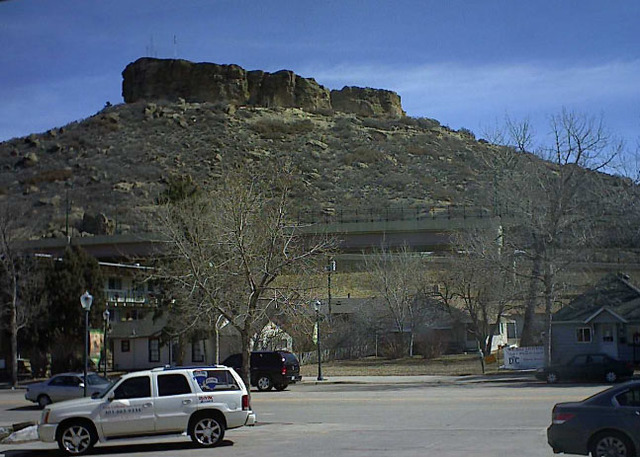 CastleRockBound.net announces its new live webcam, the "RE/MAX Rock Cam". This webcam offers a live picture of our town monument, the Rock. The image updates every 10 minutes and provides our users with the opportunity to view activity, weather conditions, traffic and the changing seasons. Visit us often to see what's happening on the Rock! Click here or on the picture to see the latest image.